Faculty of Engineering and Information Technology at Central University of Technology, Free State (CUT) hosted the final High School Quiz Whizz yesterday, 14 August 2014, as a way of promoting the importance of Science, Technology and Environment. The Quiz is in its 16th year and the theme was “Challenging Technology in 2014”. Sentraal High School (Tralies) whizzed their competition and become champions yet again! The Whizz-kids competed against Jim Fouché (old rival) and Grey College Secondary schools (last year’s winner). This is a great achievement for the school as it embraced the title for the fourth time since 1999, thereby earning the school two bursaries to the value of R 10 000 each. Jim Fouché and Grey College Secondary were first and second runners-up winning their schools bursaries to the value of R 15 000 and R 10 000 respectively. The Hoër Landbouskool Jacobsdal also attended the final round as observers after ending fourth during the qualifying round of the Quiz. Their achievement was noteworthy as it was its first year of participation in the competition. At the event, various researchers from the Faculty also presented their exciting research, showcasing valuable innovative work done at CUT. Salute to all High Schools that participated! 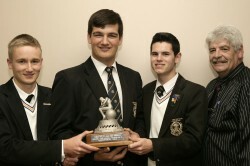 Image: 2014 winners Sentraal High School, from left: Paul Schall, Albert Human, Brandon Daffue, and Mr Carel Korff, Quiz organizer as well as Lecturer at the Faculty of Engineering and Information Technology.